The Aurora Branch set an attendance record in 1945, as recorded by Myrtle Greer in the Branch History. A Branch Conference was held June 31, 1945, in the I.O.O.F Hall. All the Odd Fellows were invited and 200 people were in attendance. 180 were non-members. President Wm. A. Matheson, John K. Edmunds 1st counselor, James N. Astin 2nd counselor. 4 servicemen sang. Also Corbett, a serviceman, was one of the speakers. Louise Erekson saved a copy of the printed program from that meeting. Notice the discrepancy in the dates. We might guess that the meeting, originally scheduled for April 29, was postponed until June 31. You have to give the branch credit for creative missionary efforts and for trying to put their best foot forward. They invited all the members of the Odd Fellows lodge as well as friends and neighbors. We assume that the meeting was held in the lodge room on the third floor of the Odd Fellows Hall because 200 people would not have fit in the long, narrow room on the second floor where meetings were usually held. To give an idea of how unusual it was to have so many people in attendance, Bob Erekson says that when he arrived in Aurora in 1941, there were only 16 active members. 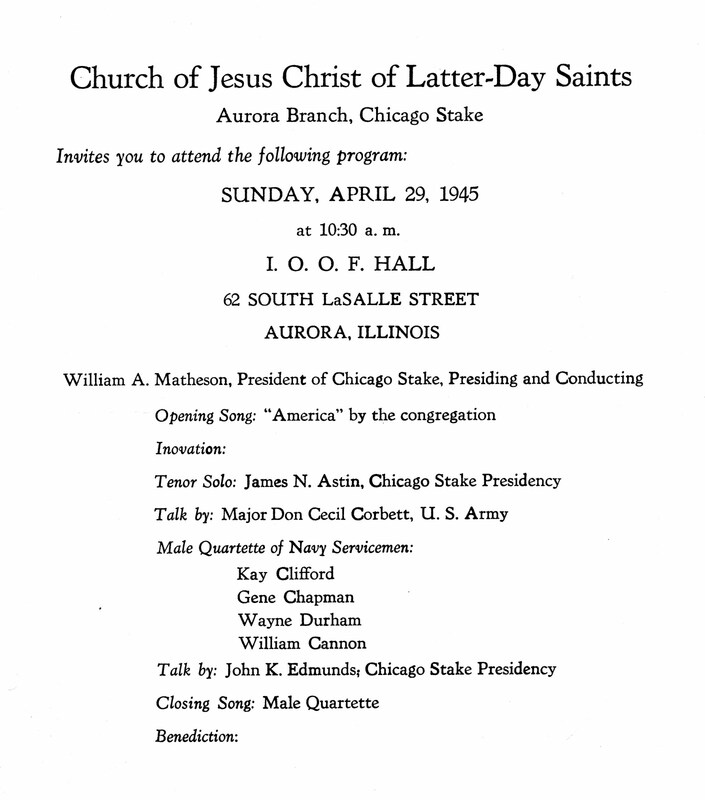 The next attendance record was set in 1957 or 1958 on an Easter Sunday when attendance topped 100. I remember the occasion because I was serving as Sunday School secretary and I was responsible for counting everyone. We have 23 members and are holding our meeting in the I.O.O.F. Hall 62 South LaSalle St., pay fifteen dollars a month rent. Today we know these early members were laying a strong foundation. Yet it is amazing to think of the faith that kept them coming week after week. Their dedication and willingness to make things happen can be seen in the following list of officers sustained at a branch conference on September 18, 1938. Ten people were filling 19 callings.